From the night of 7 April in Khartoum, Sudan. After 30 years in office, President Omar al-Bashir’s vicious days in charge of Sudan are numbered. It feels like today – the third consecutive one in which thousands of us have camped outside Sudan’s military headquarters demanding the dictator steps down – will be decisive. In fact, there are rumours that al-Bashir has already agreed to resign and that senior army officers are busy manoeuvring to work out who will succeed him (or not). "The people demand the fall of the regime." 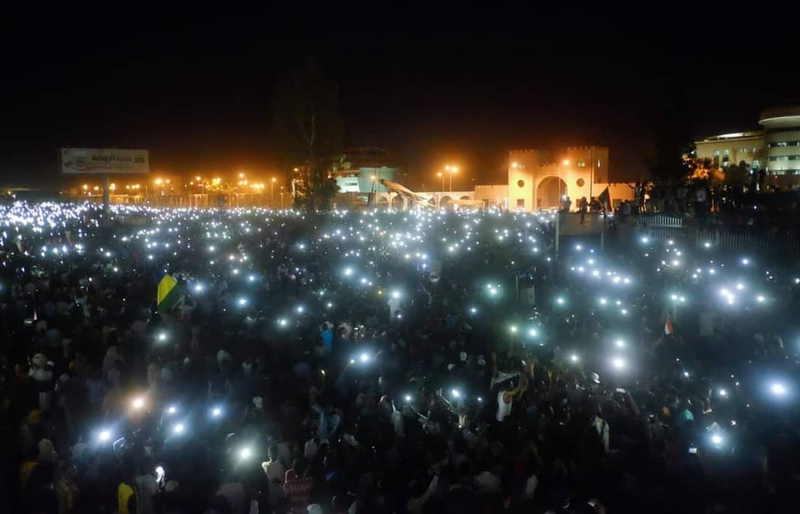 At different points, members of the powerful Sudan’s National Intelligence and Security Service (NISS) and Rapid Security Forces (RSF) have attempted to forcibly disperse the demonstrations. The RSF is al-Bashir’s private army within the army and is made up of former members of the Janjaweed, the notorious fighters who committed mass atrocities in Darfur. The movement continues, however, to demand that President al-Bashir step down. There have been protests in Sudan for several years against corruption and economic crisis, but the demonstrations since this weekend have been the biggest yet. Filling the streets, the Sudanese people are defiantly repeating Taskut Bas (“Just Fall, That Is All”) and chanting, outside the military headquarters, for there to be “One military, one people”. Foreign powers have also not shown themselves to be allies of the Sudanese people. Governments in both the east and west have been slow – or have just failed – to condemn the violence against peaceful protesters, with those in the Middle East particularly silent. This might not be surprising given foreign governments’ previous behaviour. Despite the International Criminal Court issuing an arrest warrant against al-Bashir due to charges of war crimes and genocide in 2009, for example, he has roamed freely in Africa, Asia and Russia, which he visited recently in search of financial and defence support. Sudan’s popular uprising is driven by people of all backgrounds. It includes the youth, women, children, several political parties, and opposition groups such as SPA and Sudan Call. Together, they are united in protesting against 30 years of brutal dictatorship, skyrocketing inflation, a long-running economic crisis, and the regime’s selling off of fertile lands to the highest bidder. These protesters are now banking on forging allegiances within the internally divided and discontented army. How this plays out, however, is unclear and brings with it many risks. I just spoke to some members of the RSF guarding the barracks in Khartoum north who said “we are with the people”. At the same time, I have recently seen police and NISS vehicles being deployed. Both Kamal Abdel-Marouf, the head of Sudan’s army, and Ahmed Awad Ibn Auf, the defence minister and first vice-president, are loyal to al-Bashir. Meanwhile, the NISS and its brutal leader Salah Gosh – a man who has been coddled by the West despite being accused of war crimes – have terrorised, maimed and incarcerated political dissidents and protest organisers recently. They have targeted not just opposition leaders but SPA members which include doctors, health workers, lawyers and journalists. On 6 April 1985, President Jaafar Nimieri’s despotic regime was ended in a bloodless military coup. Although the world does not seem to be watching, it feels like – 34 years later – another authoritarian ruler in Sudan is on the verge of being removed. The Sudanese people continue to organise peacefully in massive numbers, though the threat of violence against them from the embattled regime remains high. Those outside Sudan must pay closer attention to us before it is too late.